Chess-Brabo: Which openings do my opponents play? The answer which I gave at a reaction upon my previous article (see Dutch version of this blog) wasn't complete. I wrote that the number of openings even with a very narrow repertoire is gigantic. But gigantic is something intangible. Can't we define a more concrete number? Well I'll give it a try with this article. However before we start the number-crunching, we should first agree about the definition of what is an opening. I consulted multiple sources and discovered there exists no consensus about this. The summary by ECO (Encyclopedia of chess openings) is the only standard existing today but the system only categorizes the openings in 5 main-categories and 500 sub-categories. So ECO classifies openings but doesn't tell us what exactly is an opening or how many moves counts an opening. In fact it doesn't really matter for this article as we are only interested in how far somebody can be booked up. In other words how many moves can a player memorize of an opening. Of course this depends of the player and the opening itself. I know quite some lines beyond move 20 see e.g. mistakes and copycats. Beginners often don't know more than just a couple of moves. World-class-players on the other hand sometimes know lines as deep as move 40. Still a high rating is not a guarantee of knowing much about an opening see surprises part 1. In short we don't know what players know or don't know and that is only intensified by many players consciously hiding their opening-knowledge see secret. So I am obliged to arbitrarily draw a line for the opening. As reference I use the default settings to create an openingbook in Chessbase. On my blog I showed countless examples of my openingbook see green moves, to analyze using a computer part 3, studying openings part 2, using databases, ... but nowhere I explained which settings I used to create that book. 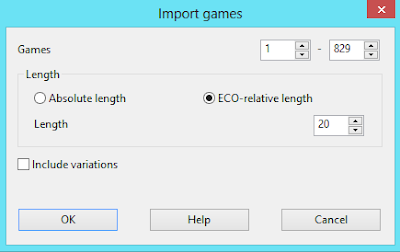 Default (standard) 20 moves are used with a deviation linked to ECO. This means we use averagely 20 moves for an opening-line. More moves are used for lines in openings defined by ECO as popular while less moves are used for lines in openings defined by ECO as secondary. So 20 moves will be used in my research as the base to define an unique opening-line. That finally allows us to check the openings played by my opponents. My personal database of standard games counts today +800. Let us see how often the same 20 first moves are played in those games or complete games if the game lasted less than 20 moves. An hour of scrolling through the database was sufficient to extract the answer out of it. The result was stunning. Only twice I got exactly the same 20 moves of an earlier game on the board. Besides I am pretty sure that these 2 unique cases can be fully linked to very deliberate choices of my opponents. In one game the Dutch IM Edwin Van Haastert copied my lost game played a couple of weeks earlier against the Belgian IM Thibaut Maenhout. It was a full scale battle with many mistakes but the final one was made by my opponent when he missed a devilish trick. The second unique situation appeared in a game of the club-championship of Deurne. I already once won in 2009 against the 1700 player Pascal Francois. In 2011 Pascal repeated the opening as the opening is theoretically healthy. I agreed as there exists an important difference between the evaluation of the engine and the practical chances in standard play. When we met a third time in 2013, Pacal had learned from the losses. You can't select an opening just by looking at the evaluation of the engine so Pascal deviated much earlier with an interesting alternative. I want to return to the original question of which openings my opponents play. In the meanwhile we have the answer. Every game a new opening is played except some very rare cases. So we can't predict which openings will appear in the future. Therefore it makes little sense to study the openings of the opponents. You could even state that it makes no sense to study openings at all at our modest playing-level. That was insinuated in a reaction of the Unknown One see article of 2012. However this is a bridge too far for me. In many openings it is an undeniable advantage to know a number of moves. 20 moves can be a good arbitrary line to define an opening but it tells very little how useful studying openings can be see my recent article the (non-)sense of blitz. As each opening has its own very specific characteristics, I can't assign one number to the number of moves which one should know to get an opening-edge. Besides this also depends on the knowledge of the opponent as only crucial additional information of the opening will lead to an advantage. Therefore the second part of this article will be covering the effect of studying openings using the scientific approach which I apply in my games. How fast does the opening-knowledge expand when only playing a very narrow repertoire? I have more than 20 years experience with this method, so I can definitely show some remarkable statistics about it. In all those years I played exclusively the same openings and only made adjustments to the repertoire when a line was broken. Below you can see the evolution of my opening-knowledge in the standard games where I was playing white. 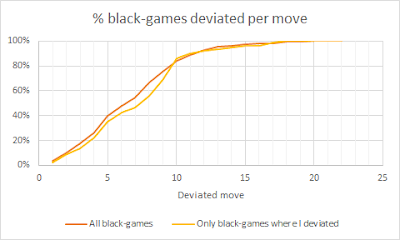 There is little difference in the evolution of my opening-knowledge for the black games I played. 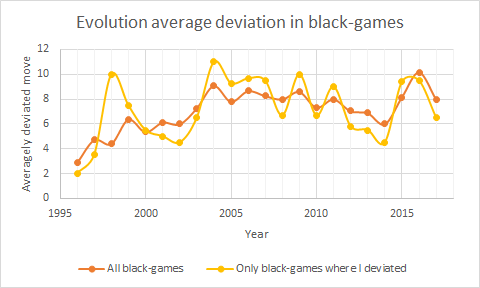 In about +400 white and + 400 black games we see an average deviation at move 8-9 compared to earlier played games. In less than 200 of the +800 games I deviated from an earlier game so where I introduced something new which I learned from earlier made mistakes. It is remarkable that we see barely any progress of the deviation during the last 15 years although I kept more or less the same level of activity. So a couple of hundred games is not enough to create depth in somebodies repertoire. I assume my strategy could work for an extrapolated number of games. We saw this in the the project Alpha zero for which 44 million training-games were played. Naturally no human will ever be able to play so many games. 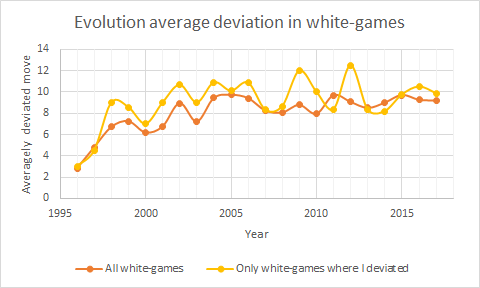 Despite averagely we see a very early deviation in the games, still in a substantial % of games the deviation from earlier played games happens later. I made a graphic about this to illustrate the % of played games linked to the move-number where the deviation happened. Below you see first the graphic of my white-games. 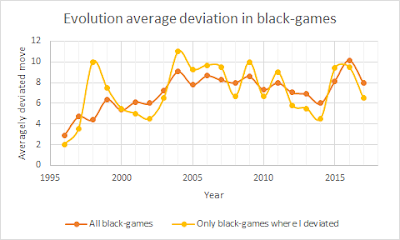 Later deviations occur less frequently in my black repertoire. This has to do with the Dutch opening which I play. White has a large variety of interesting lines in this opening which permits much more early deviations (I mentioned this already in my article a Dutch gambit part 2). From the graphics we can deduct that in 27% of my white-games there is a duplication of the first 10 moves from earlier played games. For the black games this is only 16%. 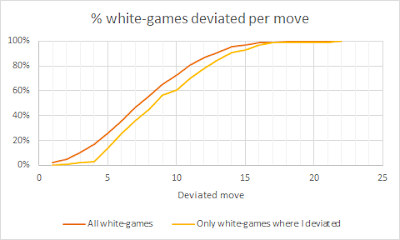 For the first 15 opening-moves we see that the share of white-games already shrunk to 3% while for the black-games to 2%. I conclude this long article. The percentages are small but not negligible. Studying the openings of your own games will bring some dividends later. We all have different ambitions and priorities so there exists no rule about which amount of study is reasonable or not. Anyway if you study only for gaining some rating-points then I fear you will get disappointed in the long run.